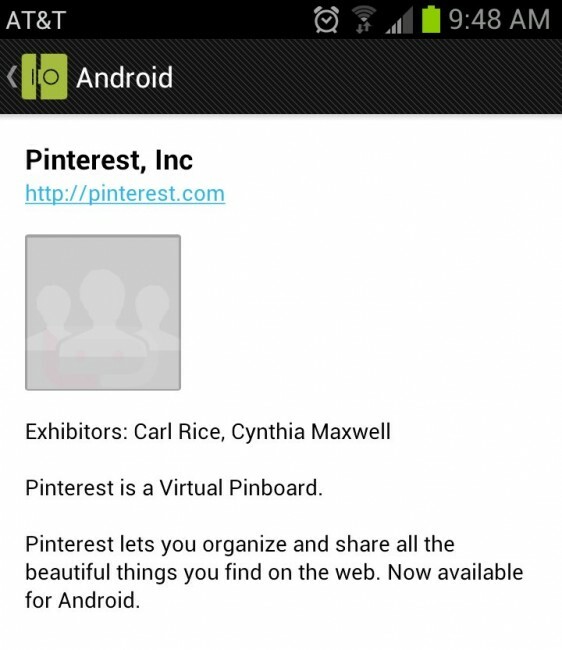 Pinterest for Android Arriving Next Week? How exciting, Pinterest appears to be headed for its Android debut next week at Google I/O. How do we know? Well, the official Google I/O app has every woman’s favorite obsession app listed in the Sandbox as a presenter. That basically means that they will have some sort of spot set up on level 2 of the Moscone Center to let everyone take their newest creation for a test drive. Many times, these Sandbox presenters are showing off future releases of apps, however, the listing for Pinterest mentions specifically that the app is “now available for Android.” It’s not yet, but likely will be within the next 2-3 days. Ladies, how you feeling? Your cupcakes, shirtless men, Louboutins, and celebrity outfits will soon become mobile.